Nothing in Trump’s campaign resonated with the American heartland quite like “America First”. But Trump wasn’t the first. Remember Charles Lindbergh? He put “America First” and paid the price. Deir Yassin Remembered (DYR) also wasn’t first but neither were we last. 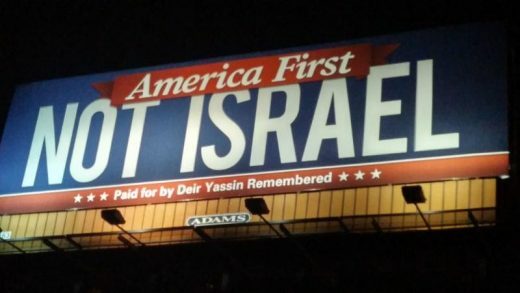 The first DYR “America First” billboard went up in Detroit in November 2015. It didn’t last long but such is Jewish power. It re-appeared on February 6 this year near Ann Arbor, Michigan but, just one week later, DYR received a call from Adams Outdoor Advertising General Manager Mike Cannon saying that the board had to come down. Such is Jewish power. Working together, officials of the American Jewish Committee, the American Jewish Congress, and the ADL would approach the publishers of major newspapers and owners of radio stations in cities where Smith [substitute any “anti-Semite”] had scheduled appearances to ask that Smith be given no coverage whosoever. If newspapers and radio stations failed to cooperate on a voluntary basis, Jewish organizations were usually able to secure their compliance by threatening boycotts by Jewish advertisers. So where now? Try another site? Turn it into a lapel pin? Put it on a truck and drive it cross-country? Please send any ideas to us here. Deir Yassin Remembered seeks progress on behalf of the over 100 Palestinian men, women, and children who were victims of the Deir Yassin Massacre. Read other articles by Deir Yassin Remembered, or visit Deir Yassin Remembered's website. This article was posted on Monday, February 20th, 2017 at 4:14pm and is filed under Patriotism, The Lobby, Zionism.